The Season XVI WPT Tournament of Champions is around the corner. On Thursday, May 24, 2018, World Poker Tour title holders will embark on fabulous Las Vegas to compete in the prestigious event at ARIA Resort & Casino. The final table will play out at Esports Arena Las Vegas at Luxor Hotel & Casino on Saturday, May 26. In lead up to the event, WPT.com is featuring all of the winners from Season XVI, who, along with the hefty first-place prize, earned a $15,000 seat into the season-ending WPT Tournament of Champions. Next up is Larry Greenberg, who topped a field of 126 entries in the WPT Bellagio Elite Poker Championship to win $378,879. Larry Greenberg’s win at the WPT Bellagio Elite Poker Championship solidified his place among the top performing businessmen in the poker world. The 54-year-old former hedge fund manager from suburban Boston took down a, well, elite field of 126 entrants to earn his seat in the WPT Tournament of Champions. Greenberg declared before the final table that if he won, part of the $378,879 in earnings would go toward a buy-in to the $300,000 Super High Roller Bowl. His proclamation came true and Greenberg has a busy week of poker lined up for himself at ARIA Resort & Casino. Greenberg has cashes on the World Poker Tour dating back to Season VII. Now retired, Greenberg enjoyed his transition from the hedge fund by taking down his first career major title. Greenberg competes against the best on a regular basis when he enters WPT Main Tour events, as well as high rollers. The Super High Roller Bowl is a new level for Greenberg and he warmed up to the event with a prior cash in the WSOP $111,111 One Drop High Roller along with entries in other $25,000 to $100,000 buy-in events. When Greenberg sits down at Super High Roller Bowl, he’ll join fellow Season XVI champion Dennis Blieden. Blieden’s $1 million score at the WPT L.A. Poker Classic paved the way for his entry. The limited schedule that hamstrung Greenberg is looser since his retirement. Greenberg has a condo in Las Vegas and played recently on Poker After Dark. The first win is made more special for Greenberg by the support he received from the rail by his daughter, Lindsay. Lindsay Greenberg was on the rail for all of the final table to cheer her father to victory. 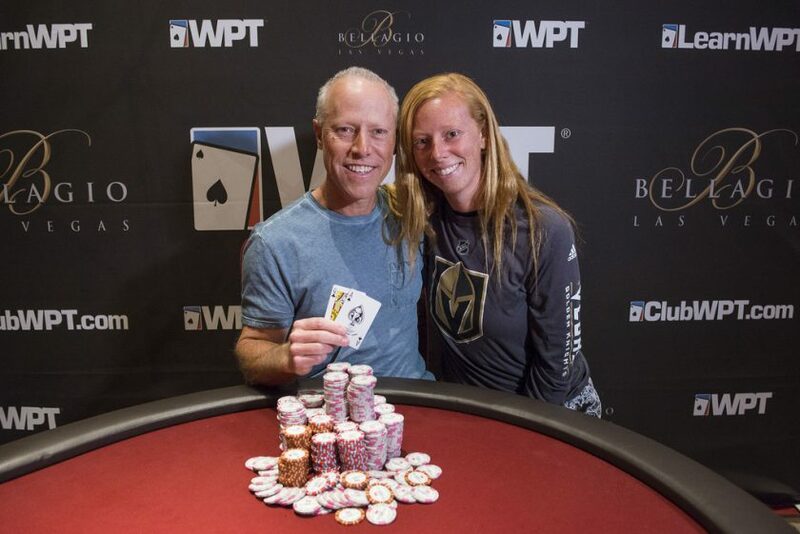 The younger Greenberg sat a table length away from her dad for eight hours the day after the WPT win as he competed in the WPT Bellagio $25,000 High Roller. The Greenberg family went through a tragic loss in 2017 when Larry’s son, Jeffrey, passed away. “Winning the title with my daughter meant everything to me as we have had a very tough year losing our son and her brother last year,” Greenberg told WPT.com. Greenberg’s foray into more high roller play is a result of the work he’s put into his game. The time away from Greenberg’s day-to-day living opens up additional focus for his passions. Poker being one of them, Greenberg plans to spend more energy than ever to compete at a high level against the best in the world. The welcome meeting with tenacious opponents is a loaded affair for Greenberg at ARIA. The $10,000 buy-in WPT Bobby Baldwin Classic presents Greenberg with the rare chance to go back-to-back in winning WPT Main Tour events. The WPT Tournament of Champions boasts the best from all eras of the World Poker Tour. Super High Roller Bowl is a new adventure for Greenberg, who stands as one of 48 in the ultra-high-stakes event. Should Greenberg continue his recent level of success he may soon find himself among “the best” that he wants to beat.